The members of the Birchwood School Nature Park committee help with upkeep the Park's trails and gardens, plan and present learning events for kids, raise funds, and and plan for the park's future. Family members can also sign up to provide one-time help on our learning events. Want to help? Visit the volunteer page here to volunteer for a particular committee, or email the parent contacts below for more information. Also, materials about the history of the Nature Park, fundraising for its redevelopment, gardening information, and curriculum materials about the plants and animals that can be seen in the Park are available here. The 2014-15 Garden Club is Underway! Under the direction of Mike Cooper & Katie Cowley-Cooper, 14 kids are growing and tending plants intended for consumption at home (during summer Club family harvests) and in the Birchwood Cafeteria's new "Garden to Table" Program launching next fall! Watch the slideshow of all the fun the kids are having. It's not too late to join in, either! There are still slots available for gardeners at every grade level. Contact Mike Cooper & Katie Cowley-Cooper to sign up! Birchwood Nature Park Debuts STORYWALK® during the BBQ! In between enjoying burgers and hot dogs at the Back To School Barbecue on September 9th, 2014, students and parents visited the Nature Park and enjoyed our debut StoryWalk®! Walkers discovered Lois Ehlert's "Red Leaf, Yellow Leaf" as they strolled along the main trail and enjoyed the beauty of our Park. Laminated pages from the book were posted on new wooden display stands scattered along the entire length of the main trail. They provided fantastic illustrations of tree and other wildlife that can actually be found in the park, and lots of learning! If you didn't get a chance to walk the trail yourself, check it out before the snow flies. Birchwood community members also enjoyed the beauty of the school gardens, which were bursting with nasturtia in full orange and yellow bloom, mint and basil, and the last of the summer's vegetables. On May 14th, 2014, several of the 70+ budding gardeners who requested and received a Birchwood PTO custom-made planting kit brought their seedlings back to plant in our NEW raised vegetable beds in the Birchwood School Nature Park! Many thanks to the Master Gardeners and volunteers from the Cornell Cooperative Extension who helped out with expertise and on-the-site planting guidance! You can learn more about the CCE and its fantastic programs here and in our article below. If you didn't get to plant your seedlings at Birchwood, it's fine to make a little garden at home. Go here to see everybody's log notes as they updated the group on their plants' status during the last few weeks! On June 18 & 19, 2014 Biology professor and Birchwood parent, the amazing Stephanie Vernooy, led students in discovering what kind of creatures might be living in our Nature Park stream! Many insects (mayflies, stoneflies, caddisflies, midges...) are aquatic in their larval form. The kids used nets to scoop out samples from the stream and identified the creatures they found. Lori Lembo, another lovely Birchwood parent, led students in an activity to learn about veggies and herbs from home gardens that could be transformed into simple snacks and sides. Students took samples and recipe cards home with them! Nature Park Featured on Schenectady Today! Find out more about Ann Parillo, host of Schenectady Today, and her great show here. So, what IS the Cornell Cooperative Extension? The CCE is a huge blanket organization for many programs, including training and certification for Master Gardeners, a source for 4H training/formation and the host of Roots and Wisdom, a program in which Schenectady County youth and adults work together to grow organic vegetables for donation to local food pantries and shelters and for sale throughout the county. CCE offers a Master Gardener hotline, manned by volunteers to answer questions. Other services offered are accepting soil samples from yards, gardens, etc., and giving advice on amending the soil to suit the plants you plan to grow. They also accept snips of diseased branches, insects you need identified--and can even advise you on what to do if a groundhog or woodchuck dug a hole under your porch! The CCE is a really great team of people who have participated in the training, logged many hours of personal experience, and provided many hours of volunteer service in the community. You can learn more about them or contact them here. Students, staff and parents have continued to do fantastic things in the Nature Park during its second year of recreation and renovation! Slideshows of events from both last year and this year can be viewed here. Take a look! We're delighted to report that our grant application to the Niskayuna Community Foundation was successful, and we are one of the 2013 Grant Awardees! We asked the NCF for nearly $5,000 to fund a butterfly garden and up to three raised vegetable beds (and their contents), purchase materials to add signs and bridges and repair trails, purchase water tests so students could begin evaluating our pond and stream life; and to purchase 2 nature-focused nonfiction books per Birchwood student for our leveled reading bookroom. Because of there were a high number of applicants for the NCF awards this year, we received a partial award of $2500. However, a number of generous donors matched this amount to increase our funding to just over $4800. With this, we are already starting on the ambitious plans listed above. We are deeply grateful to the NCF and our other private community donors for supporting us in our renovation and expansion efforts for the Park! 55 students joined in the kickoff Nature Club Seed Planting & Earth Day Art Event on April 16th, 2013! They planted salad, peas and parsley in pots to take home, and decorated bags with Earth Day themes for a Nisky Co-op contest. On May 21st, 2013, almost 50 students joined 10 adult volunteers for the 2nd Nature Club event, Stream & Garden Planting! peas and parsley pots to plant in the new pallet vegetable gardens on the south lawn. In their rainboots, Crocs and Keenes, the kids also joined in a stream-stomping event led by Dr. Stephanie Vernooy, Birchwood parent and Biology professor at Siena College. They netted samples from the stirred-up stream and with magnifiers, identified tons of insects and other life forms! Scavenger hunters also successfully located three common local plants. And at the art station, kids painted rocks to use as home garden markers. If your child attended the event, please let us know here how it went! Your input helps us improve! Niskayuna Co-op Earth Day 2013 Brown Bag Art Contest Winners Announced! Students at the first Nature Club event decorated brown bags with Earth Day themes to enter in an art contest sponsored by the Niskayuna Co-op and TCBY. Congratulations to the Birchwood winners! Each student winner below received a gift card from TCBY and a certificate. The Birchwood students aren't waiting around for us slowpoke adults to get things moving! They have started a grassroots funding campaign called "Paws for the Park" to raise money for our spring garden beds. "Paws" has raised $93 so far! Did you miss out on buying a Paw at the Fun Fair? Complete this form and return it (in a sealed envelope with your $1.00) to school. We'll complete and hang a Paw in the cafeteria for you! The Nature Park has also gotten a boost from the 5th grade class of 2013. The 5th grade class is using funds they raised to donate a maple tree to Birchwood, plus a gift card to the Birchwood School Nature Park. Thank you, 5th Graders! Your legacy will keep your memory "green" in our hearts! 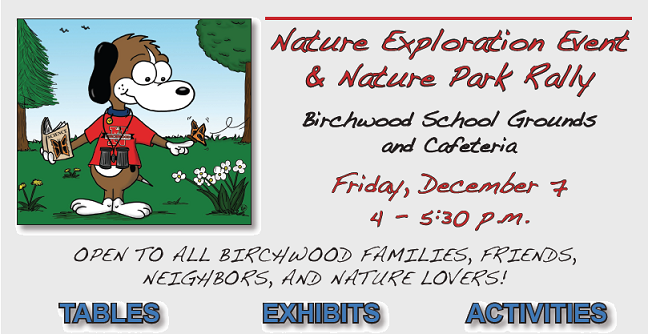 The Birchwood Park Nature Exploration Event & Rally was held on Dec. 7th, 2013. It was a HUGE success! Visit the Rally page for more details. The Birchwood School Nature Park restoration project got tons of great publicity in 2013. Read about us here! And although we didn't win the Clorox "Power A Bright Future" grant contest (our first attempt), we achieved a voting final rank of 151 out of 1595 nationwide candidates in the "Explore" category, scoring in the top 10%! The December 2012 Nature Rally, part of our work to publicize voting for the Clorox grant, also gained us lots of support and attention from our Birchwood community and the community at large. Fundraising efforts (and fun) will continue on behalf of the Park! To join us in our restoration efforts, sign up as a member of the Birchwood School Nature Park Committee, or email us so we can keep you in the loop! While searching the web, a PTO member stumbled across and shared a treasure trove of articles on Birchwood from the 1950s and 60s. Amazingly, the articles described the wooded area behind Birchwood Elementary as a thriving, vibrant Nature Park, complete with trails, a forest classroom, a pond for wildlife study, a greenhouse, the first school aquarium, and even a "zoo"! This wonderful resource served as a model for schools from the surrounding area (see photos and captions below), and provided Birchwood students with the opportunity to study nature in their own "backyard." A few of us headed back there in November 2012 to see what remained, accompanied by NYS Department of Environmental Conservation Chief Botanist Steve Young. The news was good. Although the greenhouse had been removed to Rosendale Elementary, most of the original trail system, the forest classroom, and the weir of the study pond (minus its gate) all remained. The area still hosted a strong and varied ecosystem, including a hardwood forest, an evergreen stand, fern gullies, a living stream, and even a small wetland--all of which could provide Birchwood students with hours of learning in and about the natural world. Our dream today is to (re)create a comprehensive and sustainable Birchwood School Nature Park, beginning by clearing the overgrown Nature Trail and Forest Classroom, and extending the trail system into the east side of the Park. Following that, we plan to add raised vegetable gardens, a butterfly garden, compost and rainwater harvest systems--maybe even a greenhouse! We also hope to make the Park a solid academic resource by purchasing tablets for Nature Park use, as well as collecting books on a wide variety of topics including nature, gardening, and the environment to supplement our leveled book room nonfiction collection. The expanded Nature Park will enrich classroom curriculum, provide extra space and materials for instruction, support better nutrition through a garden-to-kitchen program, and provide opportunities for new ASEP classes and partnerships with community groups (including our Birchwood Scout troops).